Through the globalization movement and the use of technology that connects us both personally and professionally, the world has become smaller on multiple levels. Today, we have a better understanding of other cultures, regularly collaborate with peers from around the globe, and increasingly have a shared awareness that our futures are intertwined as we share one planet and its limited resources. KDP has a rich legacy of promoting global understanding through the sharing of knowledge and establishing relationships with people from around the world. For example, in 1948 as KDP President, Dr. William Robinson gave 200 subscriptions of the Educational Forum to educators living in occupied Germany and China. 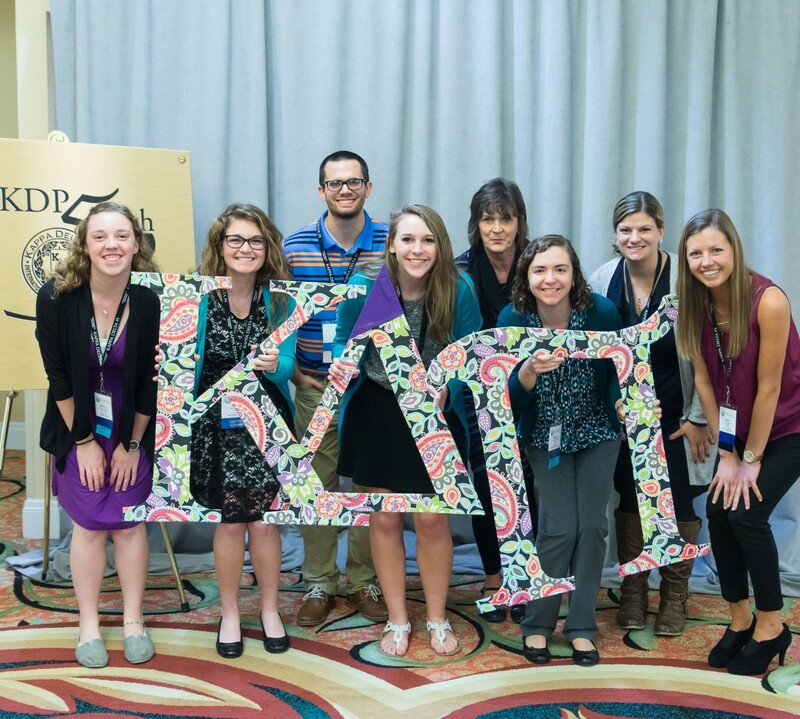 Throughout our history, KDP has embraced activities, partnerships, and advocacy efforts that support our long-standing commitment to equity, global awareness, and quality learning for all. With a goal of supporting global education endeavors and building the organization’s capacity, KDP applied for and was granted the status of a non-government organization, or NGO, of the Department of Public Information of the United Nations in 2010. Today, we are celebrating the 7th anniversary of being recognized as an NGO of the United Nations! KDP has five official representatives—which include three professional representatives and two youth representatives (between 18 and 25 years old). Our representatives attend the weekly briefing, meetings, seminars, receptions, and other activities, and then share the information with the KDP community to keep you informed of critical global issues and to provide you with suggestions for integrating this relevant information into your classroom. The weekly briefing topics range from girls’ and women’s access to education, immigration, population and development, and special youth events. Click here for an example of a recent Briefing Report on A Grassroots Approach to Education for All from one of our youth representatives, Clairetza Felix. Since receiving official NGO status, KDP has fulfilled its role in a variety of ways, including hosting a conference with the Committee on Teaching about the UN on peace and conflict resolution and ongoing participation in various UNESCO meetings including the International Network of Teacher Education Institutions and the Asia-Pacific Institute for Education for Sustainable Development. Personally, I serve on the Expert Committee for this Institute. KDP’s mission of quality learning for all and our strategic goal related to sustainability literacy align with the UN Sustainable Development Goal 4, which speaks to a quality and equitable education and lifelong learning opportunities for all. The UN and the world have realized that achieving the 17 Sustainable Development Goals, which were adopted by the U.S. government in 2015, is dependent on education, and more specifically the transformation of education. You may still have questions about what exactly sustainability literacy means. A student who is educated for sustainability has the ability, ambition, and know-how to create a world that works for everyone and every creature, now and forever. So what needs to happen to achieve the necessary level of knowledge, skills, and dispositions to be sustainability literate? The integration of sustainable education calls for changes in the classroom, in the school, and in the community. It requires new approaches to preservice and inservice teacher professional development, a targeted research agenda, revised conceptions of student assessment, updated school policies, and inspired leadership. 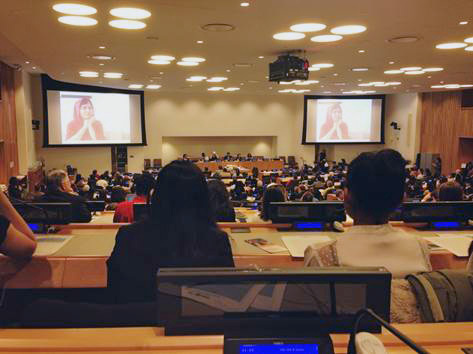 Aside from our focus on sustainability education, the UN’s events and resources help us, as educators, and our students to be better global citizens by reminding us of key events and milestones throughout the year. For example, November 19 is World Toilet Day, a day to raise awareness and inspire action to tackle the global sanitation crisis and the fact that 2.4 billion people do not have access to a toilet. Our role and responsibilities as an NGO to the United Nations and our access to the wealth of quality resources and knowledge on timely global topics the UN produces play a key role in the work of KDP and our community of educators who strive to create a better future. As educators and citizens, we are reminded of the necessity of thinking globally while acting locally. There has never been a more important time to be an educator. I encourage you to check out the blogs of our representatives and the UN resources on our website as great ways to stay current on the issues, challenges, and opportunities that are impacting our world. The moderator, Alexander Wiseman, and speaker Lisa Damaschke-Deitrick were from Lehigh University’s education program. Their fellow speakers were Anwar Sayed from the Dayemi Foundation, Taylor Viens from Caring for Cambodia, and Jadayah Spencer representing the International Youth Leadership Institute. As each person shared their experience with grassroots organizations, they connected to the importance of health and wellness. Health screenings and access to meals can transform the culture of learning to be responsive to the needs of students. Furthermore, research presented at the briefing proved that funding new educational approaches results in shifts in curriculum and assists in combating poverty. With political and religious turmoil displacing refugees, it is imperative that they receive a quality education that is inclusive and sensitive to their knowledge and cultural backgrounds. As expressed by the speakers, partnering with local organizations within communities such as religious centers and non-governmental agencies can offer real-world experiences for our youth, as well as promote positive learning environments. Get to know the people in your community. Seek out local businesses and organizations that are interested in helping us achieve our goal of providing an equitable education for all. Think of ways that you can support a student’s hygiene and diet at your school, such as items like toothbrushes and soap. A resource such as a school-wide food pantry would also be effective. Encourage students to be problem solvers in their own communities. Simple tasks such as cleaning up parks and recycling can prepare them for bigger roles in society. The fifth of October each year marks World Teachers’ Day. 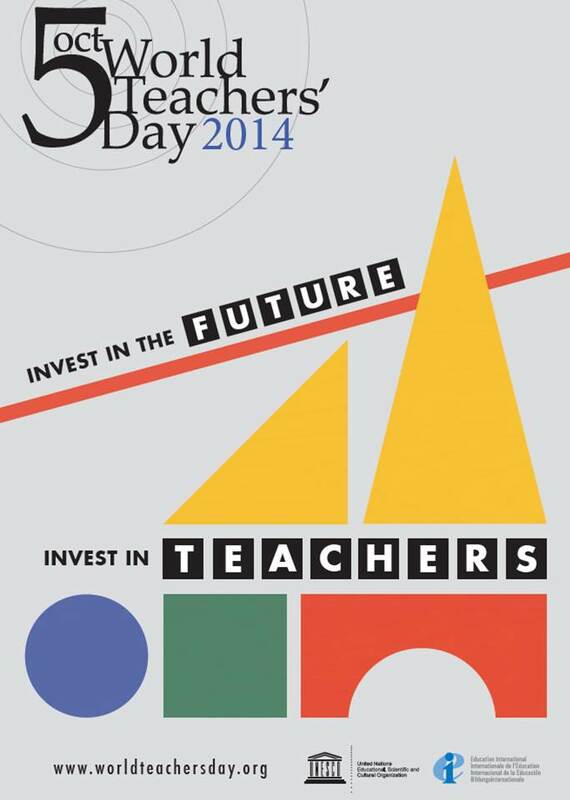 This day of recognition is devoted to appreciating, assessing, and improving the educators of the world. The theme for this year Day is “Invest in the Future, Invest in Teachers.” Teachers are an investment for the future of all countries. What today’s children will face in adult life cannot be predicted; therefore, the teachers of today and tomorrow need the skills, knowledge, and support that will enable them to meet the diverse learning needs of every girl and boy. On October 5, 1994, the first World Teachers’ Day was held. This event has been organized on the same date each year since then. However, local events may be on some other date close to October 5, so that they do not fall during fall (northern hemisphere) or spring (southern hemisphere) school vacations. In 2002, Canada Post issued a postage stamp to commemorate World Teachers’ Day. World Teachers’ Day is a global observance. In some areas posters are displayed and pupils and ex-pupils are encouraged to send e-cards or letters of appreciation to teachers who made a special or memorable contribution to their education. Trade unions or other professional organizations that represent teachers play an important role in organizing World Teachers’ Day events in many countries, including Australia, Canada, India, Japan, New Zealand, the United Kingdom, and the United States. Appreciate those who have taught you by sending a card, ecard, or email to thank them. Appreciate your teaching colleagues and mentors. Let them know! As teachers and future teachers ourselves, we can often pinpoint particular teachers who impacted our lives. Share your stories of on KDP Global. Assess the effectiveness of teachers presently in the profession. The essentials for supporting teachers’ effectiveness are (a) good conditions of employment, including appropriate contracts and salaries, and prospects for career progression and promotion; (b) good conditions in the work environment, based on creating school contexts that are conducive to teaching; (c) high-quality pre-and in-service training for teachers, based on respect for human rights and the principles of inclusive education; and (d) effective management, including teacher recruitment and induction and mentoring. If one of these is missing where you are, work to upgrade the conditions. Improve the quality of teaching in your local schools, in your state, and around the world. KDP members are the best teachers; you are needed. Consider teaching in an urban area. By 2018, more than half the world’s people will live in cities. Urban schools are in dire need of good teachers. Consider teaching in another country for a year, two years, or five years to help alleviate the shortages of teachers. Your students could become pen pals to students in a school in a different state, province, or country. Your class could do fund raisers to support a school in a third world country. As teachers, we have invested our lives in teaching; we are investing our money and time in becoming better teachers. We feel that what we do every day (and evenings and weekends usually) is investing in the future through the students we teach.